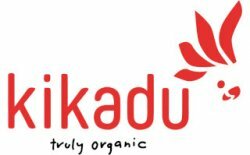 Kikadu is a German Company, founded in 2016, from 3 women: SILVI, MANO and GINKA. • Silvia Henneka (Silvi): experienced designer and managing director at Stuttgarter Traditionshauses Korbmayer. • Their certified materials come from a manufacturing facility in India. • Their natural rubber is extracted and processed in Sri Lanka. • In Sri Lanka it is manufactured into our products. Each individual piece is finished by a sewer. Each product tells a unique story. • Their filling materials are made from recycled PET bottles and help to reduce greenhouse gas emissions. They are a better alternative to natural fillers that are not properly dried and tend to mold. • They work with environmentally friendly transport companies to deliver our products to Europe and compensate for our CO2 emissions, and their favorite pieces are stored in Stuttgart (Germany). THEY KNOW THEIR FACTORY: They don´t produce our goods in any random place. After careful consideration, they chose a factory in Sri Lanka to be their partner, to ensure the best possible transparency. They pay their employees in Sri Lanka a salary that is about 3.5-4x over the minimum wage and offer family-friendly working hours. In addition, their employees receive kindergarten and school vouchers for their children. 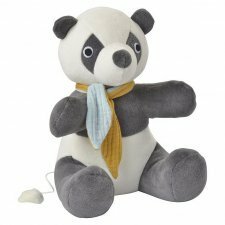 ECOLOGICAL TOYS: Fashion for children should be made from skin-friendly materials, as children's skin reacts very sensitively to all types of harmful substances. The cotton used by kikadu is natural, not chemically dyed and thus friendly to your child’s skin and the environment. No to pesticides or other residues. No to optical brighteners and yes to formaldehyde and glyoxal free Equipment. They also use nickel free metals for buttons and Zippers. THE EN71 STANDARD: kikadu toys are always manufactured according to the EN71 directive and of course CE-certified. The following aspects are covered: Mechanical functionality, noise, fire refractoriness, chemical composition, electrical safety, hygiene and radiation. For kikadu, the safety of our children is of utmost importance! This music box mobile is a real eye-catcher. The design with colorful lanyardsis a clever accessory that not only delights children's hearts but also accompanies the little ones in a magical way into the world of dreams. Music box (Brahms lullaby) can be easily replaced by zipper (with the help of a paper clip), with the hanger hanging almost anywhere. This music box mobile is a real eye-catcher. 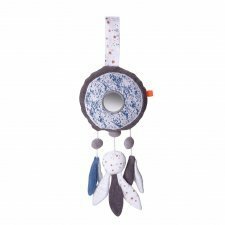 The design with colorful feathers is a clever accessory that not only delights children's hearts but also accompanies the little ones in a magical way into the world of dreams. Music box (Brahms lullaby) can be easily replaced by zipper (with the help of a paper clip), with the hanger hanging almost anywhere. This music box is a beautiful panda bear to play, but it also magically accompanies children in the dream world. The design in neutral colors cream and gray is combined with each bed. The musical box contains Brahms' lullaby melody and can easily be removed via the zipper if you want to wash the the soft toy. The Spiraltoy invites the baby to play and discover with its various activities. It can be attached almost anywhere. All figures, the sweet fish with mirror, and the wing, are made of soft fabric and fluffy stuffing and encourage your child to conquer and discover.